LIBERTY CORNER, N.J., USA, and ST. ANDREWS, SCOTLAND – The USGA and The R&A implemented the new rules of golf on January 1, 2019. The USGA and The R&A finalized golf’s new Rules after an extensive review that included a request for feedback from the global golf community on the proposed changes. Golfers can now access the official 2019 Rules of Golf by visiting RandA.org or usga.org/rules. Dropping procedure: When taking relief (from an abnormal course condition or penalty area, for example), golfers will now drop from knee height. This will ensure consistency and simplicity in the dropping process while also preserving the randomness of the drop. (Key change from Proposed: the proposed Rules released in 2017 suggested dropping from any height). Measuring in taking relief: The golfer’s relief area will be measured by using the longest club in his/her bag (other than a putter) to measure one club-length or two club-lengths, depending on the situation, providing a consistent process for golfers to establish his/her relief area. (Key change from Proposed: the proposed Rules released in 2017 suggested a 20-inch or 80-inch standard measurement). Removing the penalty for a double hit: The penalty stroke for accidentally striking the ball more than once in the course of a stroke has been removed. Golfers will simply count the one stroke they made to strike the ball. (Key change from Proposed: the proposed Rules released in 2017 retained the existing one-stroke penalty). 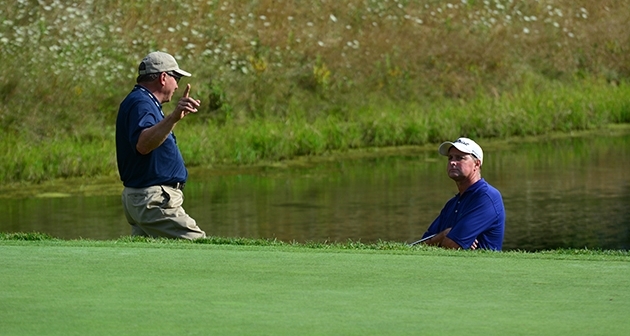 More than 30 “how-to-apply” videos and a summary of the principal changes are now available at usga.org/rules. Additional educational tools will be released in September. Players are reminded that the current edition of the Rules of Golf (2016) must be applied when playing, posting scores or competing for the remainder of 2018. The Rules of Amateur Status and the Rules of Equipment Standards were not part of this review process.